Cadence and Calahan Figas help their aunt Wendi Locatelli remove her prosthetic leg. The last thing Wendi Figas Locatelli remembered was falling asleep. The 34-year old mother of three, who grew up in Freshwater and attended Eureka High School, did not know that her body was fighting off a lethal infection, that doctors had told her husband to notify the family to come visit her one last time and that she had a 1 percent chance of surviving. When Locatelli woke up that day in early May of 2016, her right arm was dark black, and her fingers were “shriveled.” Her kidneys no longer worked. She had been struck with a septic infection several days earlier, the cause of which is still unknown. Surgeons removed both of her legs, her right arm below the elbow and the fingers of her left hand. She waves her left hand at the students and a ripple of laughter breaks out across the auditorium. Locatelli smiles with them. The speech, her first since her surgery a year and a half ago, was a favor to family friend Barb Hooper, secretary at Pacific Union. Locatelli, who was working as a dental hygienist in Woodland, hasn’t returned to work since her illness but is interested becoming an inspirational speaker who can help demystify disability and prosthetics for children. Hooper and others were active in organizing a fundraiser to help Locatelli and her family with medical expenses. She wore a T-shirt with the word “G.L.O.W.” on the front, an acronym for “God Loves Our Wendi,” the slogan for Locatelli’s boosters. "She is the kind of girl who's an inspiration for everyone," said Hooper. "She's always been a leader." From left to right, Locatelli (middle) is flanked by her G.L.O.W. team: Cheryl Gionden, Roberta Marcelli, Kathi Figas and Linda Sundberg. Several other friends and family members, including Locatelli’s mother and sister, attended the presentation, sitting together in the bleachers. Several of them dabbed away tears as Locatelli described being wheeled into the operating room for amputation while comforting the nurse who was wheeling her in. Throughout everything, Locatelli told the school children, she tried to stay positive. She ended up comforting many of the people around her when she was struggling with some of the darkest days of her life. In the hospital wing following her surgery, she was lonely, Locatelli told the students. All she wanted to do was be home and see her family – her husband Jay and their children, ages 2, 3 and 4. She could see her husband’s name appear on her ringing cell phone, but she couldn’t get the phone to respond to her touch beneath the bandages. It was frustrating. So she focused on her goals. “I had to relearn everything,” Locatelli said. A former marathon runner and downhill skier, now she struggled just to feed herself. Most of her internal organs had been spared from the infection but doctors believed she would have to be on dialysis for the rest of her life. She followed advice to visualize her kidneys “standing up.” Three days after beginning the visualization exercise, doctors took her off dialysis. Locatelli, who was hospitalized in Eureka after attending her sister’s bridal shower in early May, left the hospital in early July to attend her sister’s wedding. She continued to set goals and to meet them. 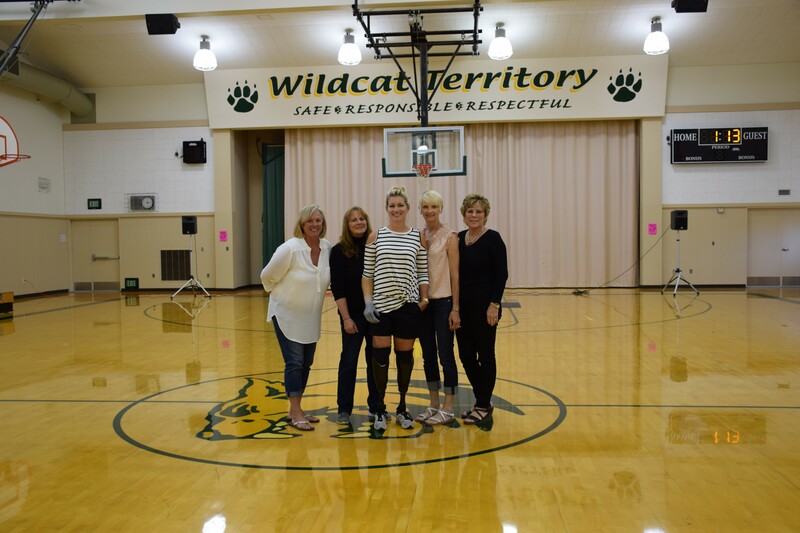 After getting her prosthetic legs in October of 2016, she set a goal to walk to the speedbump down the road from her house before Thanksgiving. That accomplished, she set a new goal: Learn to drive before New Year’s. On Christmas day she took her very nervous father for a ride. Now she can do almost everything she did before her surgery. The electric wheelchair, Locatelli told the students, is a big hit with her young children, who like to ride on the back of it. 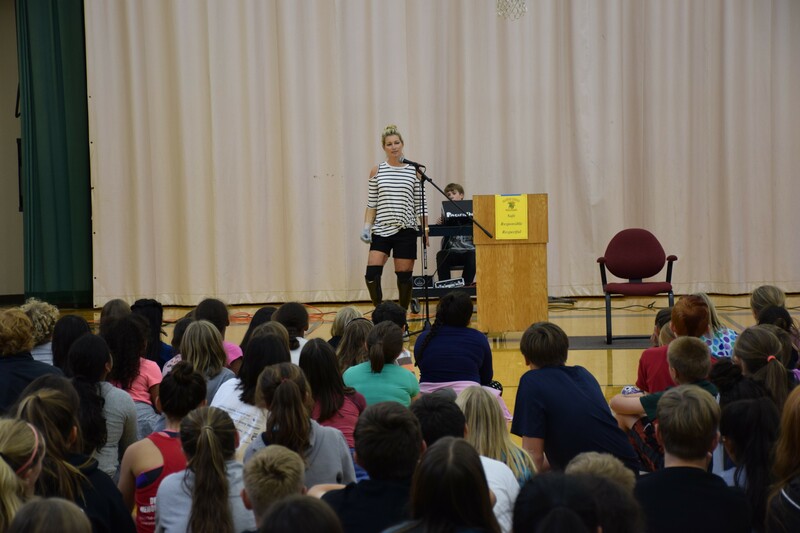 She told the students that there wasn’t one day she didn’t get up out of bed and try. Then, with the help of her niece and nephew, Cadence and Calahan Figas, she sat down and pulled off one of her prosthetic legs, displaying the stump of her thigh and its skin graft. “I know, I know,” Locatelli said, nodding matter-of-factly. She showed the students how the prosthetic worked and displayed her robotic hand, showing off how it could turn 360 degrees, to their delight. They were equally amused when she put the prosthetic leg back on and it made a farting noise. After taking a few questions from the students, Locatelli responded to a request to show how she ran. But Locatelli duly ran from one side of the room to the other to a thunderous round of applause. Afterward she accepted flowers and presents from the students, many of whom lined up to talk to her and hug her. Speaking privately to her G.L.O.W. boosters before the event, Locatelli said she has found new purpose in speaking about her experience. Locatelli tells the students she's looks different, but she's the same as their mothers and fathers.